To approach or avoid are opposites for sure, but are they opposite ends of a bipolar spectrum? Is it always the case that the more you like a thing, the less you hate it; the more you hate something the less you like it? In the language of cognitive psychology, is it always the case that the greater your tendency to approach, the less you want to avoid the thing, and vice versa? A seminal psychology paper of the 1990s by John Cacioppo and others affirms that there are genuine bipolar opposites: light-dark, up-down, hot-cold, e.g. if something is getting warmer then it is getting less cold. If something is getting colder then it is getting less warm. We perceiving and judging human beings readily translate such binary polarities to statements about liking and disliking something. “Psychologically speaking, the world is a simpler place when viewed in terms of dichotomies or bipolarities” (22). Online star rating scales operate in this manner. In assessing an app, a film, a hotel, a photograph, a purchase we are invited to rate the thing on a scale of 1 to 5. 0 or 1 means we don’t like it, and 5 means we like it a lot. Of course you can score a thing as a 3, which may mean that you are indifferent, neutral, or undecided. But there’s rarely an option to say you like it a lot and also dislike it a lot; or that you don’t much like it, but dislike it only a little. We may play along with such polar rating structures, buttressed by traditions in logic, such as the “excluded middle,” the rule that a statement cannot be both true and false at the same time, and a host of tropes and metaphors. According to George Lakoff and Mark Johnson as embodied beings we tend to regard our world in terms of right and left, one side against another – after all we have two arms, legs, eyes and ears, and spend much of our time keeping ourselves physically balanced. So it’s not unreasonable that we exaggerate binaries to the extent that more of one pole means less of its opposite. Some of us are researching stress in the environment and looking at places that people expect will induce stress (a busy street) and those that induce a more relaxed state (a park). It’s tempting to assume that people’s feelings follow an inversely reciprocal sliding scale: the more stressed you feel, the less relaxed; the more relaxed, the less stressed. In fact, it turns out to be very difficult to observe such responses from automated body monitoring and sensing (e.g. EEG). In any case, people’s self reporting of such conditions often contradicts the polarity implied in the opposition of relaxation versus stress. Here are some possible reasons. People oscillate and change from one emotional (affective) condition to another even over short spans of time. So if you ask someone if they enjoyed Star Wars: The Force Awakens, they may say in some parts yes, other parts no. Then there are post hoc pressures to conform to or reject the prevailing opinion of others. Likes and dislikes are expressed in language after all, and within communities. Stress and relaxation are no doubt similar: their intensities oscillating over time. In the case of relaxation and stress, perhaps these are not really polar opposites anyway. Being unrelaxed is not the same as being stressed, and being devoid of stress may be something other than relaxed — perhaps numbed, comatose, or bored. In the same way, perhaps like and hate are not really polar opposites either. According to Cacioppo et al, it may be the case that different parts of the cognitive system (the brain) are responsible for different feelings about or assessments of a situation. So you can feel intense pleasure and displeasure, love and hate, like and dislike, attraction and repulsion as these occur in different parts of the human organism even at the same time. If we extend cognition and affect to the whole body then perhaps you can instinctively flee from danger and at the same time feel pleasure at the experience; and people can fall into a slumber exhausted from the stress they feel. Then there’s a question about the object of the judgement. You can hate the bank manager at the same time you love your pet poodle, like the sunshine but dislike the cold wind; be drawn to the romance of the ruined ship, but repelled by the danger. Stressed out by all the work, but chilled at the thought of the weekend ahead. Wherever such feelings reside and however they span out over time, we are certainly prepared to talk that way. I think this has something to do with attention and its cognitive importance. See Attending to the world. But then there’s plenty of cultural evidence for the prevalence and importance of affective ambivalence. Another word for this is an appreciation of the sublime. See Betwixt and between. There are situations where we are both drawn to a situation and repelled by it: where admiration, disgust, attraction, repulsion, the beautiful and the ugly coalesce, or alternate, and vibrate (according to Kant). The category is often reserved for the spectacular and the unusual, but it’s really just part of everyday experience and the mixed feelings we have. Cacioppo, John T., Wendi L. Gardner, and Gary G. Berntson. 1997. Beyond bipolar conceptualizations and measures: The case of attitudes and evaluative space. Personality and Social Psychology Review, (1) 1, 3-25. 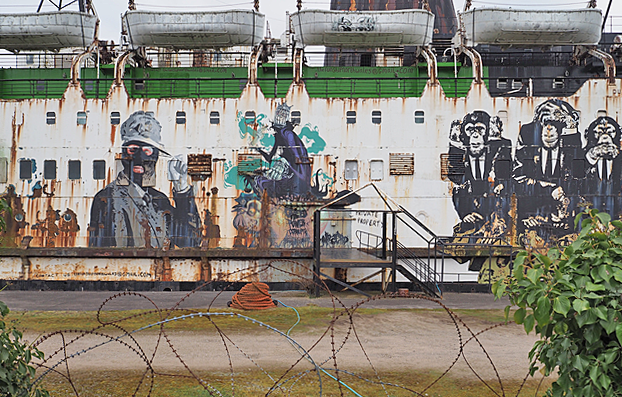 The ship above is the TSS Duke of Lancaster recommissioned as a nightclub and moored off the north coast of Wales but later abandoned. Then there’s the idea of meta-emotions, feelings about feelings (happy to be able to grieve, bored with being happy, enjoying the alternation of stress and relief) as I explored in Coyne, Richard. 2016. Mood and Mobility: Navigating the Emotional Spaces of Digital Social Networks. Cambridge, MA: MIT Press. Melancholy is often described as a meta-mood.